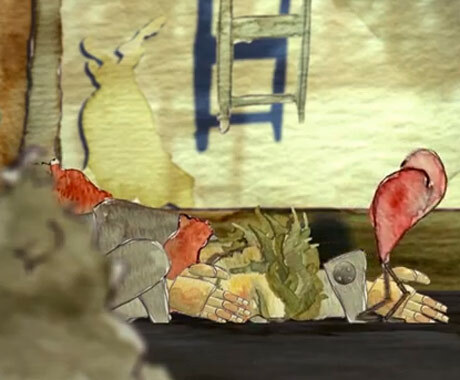 Calgary folk-pop band Woodpigeon have brought an emotionally stirring video to the table for their latest Thumbtacks + Glue single, "Robin's Song," presented delicately through the use of stop-motion paper cutouts. Put together by film-maker Andrei Feheregyhazi, the clip has a moustachioed man trying to track down his heart in the big city. We see him scuttle after an anthropomorphic ticker through a train station before the landscape crumbles around them. Finally, the guy takes a breathtaking leap of faith in order to bring some feeling back into his life. You can check out the marvelous mini-movie, scored by Woodpigeon's sweet and symphonic pop melodies, down below.